After three years of dating and trading nights at their respective New York City apartments, Emma Feit and Nick O’Hare are moving in together. Or they will be, as soon as they find the right place. For two happily-in-love professionals–Nick’s a teacher, Emma tutors college-bound teens–with good credit and stellar references, how hard can it be? As it turns out, very–in ways that are completely unexpected. Suddenly Emma is filled with questions about cohabiting, about giving up her freedom–not to mention about who’s going to clean the toilet. And while her best friend plans a dream wedding to her wealthy fiancé, and her older brother settles into suburban bliss, Emma must figure out what home means to her–and how on earth to get there. 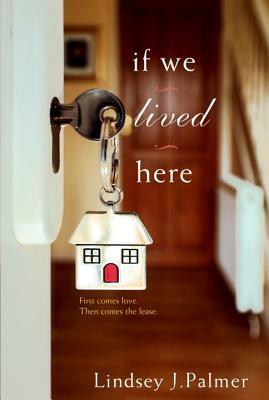 Finding an apartment seems to be harder than finding love in Lindsey J. Palmer’s novel If We Lived Here. The story is set in New York City and focuses on the relationship between Emma Feit and Nick O’Hare. They have been together for a few years and (they think) they’re ready to take the next step: cohabitation. Emma and Nick are both flawed–as all the best characters are–and, at times, I really didn’t like either one of them. But the narrative was so sharp and insightful that I couldn’t help but be drawn further into the story. As Emma and Nick search for a new place to live together, they both second guess the decision and their relationship. Their conversations and internal thoughts and motivations take readers behind the curtain to see what’s really going on; I liked that the story is told from both of their points of view. I think it made the story that much more rounded and developed than if only Emma or Nick had narrated. Like a relationship, If We Lived Here benefited from sharing the thoughts–good, bad, and ugly–of both people. Emma’s job preparing young adults to get into Ivy League schools keeps her on her toes and Nick loves being a fifth grade teacher. Their differences seem to make them the perfect fit for one another, but the doubts that creep into both of their minds were rather telling. It’s one thing, after all, to love another person and to be in a relationship when you can both retreat to your own places and spaces. How would they handle being together 24/7? In the midst of the pair taking this step in their relationship, Emma’s best friend is taking the next big step in her own relationship – marriage – and her brother seems to have the perfect suburban life. The pressures of being single or even those placed on Nick and Emma who, while together, aren’t married, are explored with fine focus, as are the pressures of family, changing friendships, and fidelity. For me, If We Lived Here is the literary equivalent to the film “The Family Stone.” I really didn’t like it at first glace. But the more times I saw the movie – and the longer I thought about the book after finishing – the more I came to appreciate both. It’s an extremely well-written novel. I spent much of the time thinking that Emma and Nick were all wrong for one another and expecting them to break up. In the end, I admire the depth of their relationship and the skill it took for the author to show we readers that depth. My thanks to Kensington and NetGalley for an ARC in exchange for this honest review.